It's a drone! It's a motorcycle! No, it's a Hoversurf hoverbike! 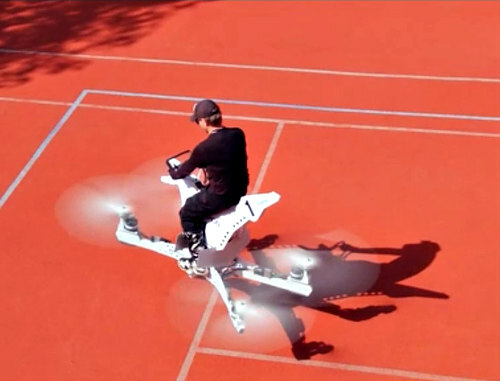 : Hoversurf hoverbike image via Hoversurf Inc. It was bound to happen sooner or later. And, in this case, it's been in the works for quite sometime. So, just what are we talking about? A piece of technology that for once didn't come out of Japan first, and that is a hoverbike that has actually gotten off the ground — for real. If not the Japanese, you're probably asking yourself, then who? The U.S., perhaps? Maybe China? Nope, wrong on all counts. This futuristic device comes straight from Russia courtesy of a drone startup by the name of Hoversurf. The name is apt in this case, because the latest big boy toy seems to surf along hovering over the ground like a Jet Ski floating above water. Due to this, it's hard to say it actually flies, because at this stage it more or less seems to float in a semi herky-jerky manner, but it's still cool. The company behind it recently unveiled the new hovercraft, that has so far been dubbed Scorpion-3, in a video depicting a test-flight it underwent, which has made it the very first manned quadcopter drone to have undergone a trial run, according to science and technology news site Futurism. At this stage, the electric-powered bike resembles a cross between a motorcycle, a Jet Ski and a drone. It's definitely nothing that will elicit remarks like "Wow, ain't she a beaut!" or low whistles, but the fact it's achieved lift off is still pretty impressive. It won't be long until the scores of other groups trying to achieve the same thing will be releasing their versions of it and then they should eventually begin to find their way into the mainstream public — which is a terrifying thought. Now that we've gotten used to drones, this and other inventions utilizing the technology don't seem so out of the ordinary or fantastic. As far as air and space technology, it should come as no surprise to anyone that a Russian company is behind this particular project, either. Besides beating us into space, the first jet pack was actually developed by Russian inventor Aleksandr Fyodorovich Andreyev back in 1919, while many people still believe it was a NASA project or a Get Smart invention from the '60s. This piece of equipment by Hoversurf uses proprietary software that allows the engineers to limit both the range and velocity the contraption is able to achieve in order to ensure the rider's safety. The look of the craft is said to have been inspired by motorcycle frames of the type used in X games. It will be interesting to see what the regulations and restrictions turn out to be in connection to the average Joe on the street purchasing and operating a vehicle such as this. So far, people can't even operate their small, personal drones properly or safely without crashing them into things and people or steering them into restricted airspace. Most of those weigh relatively little. A craft like this with the added weight of a human or humans, plural, could really do some damage. One can just imagine the problems and the bodies piling up from dips#@ts all over the world pulling a Darwin Award with their must-have new hovercraft that unfortunately involves others, like innocent bystanders minding their own Ps & Qs. It's said Dubai is developing a project that would involve a self-driving hover-taxi in the very near future, and other countries surely can't be far behind it. If and when these types of levitating crafts do go mainstream, ambulance chasers around the world will surely rejoice. Personally, I'll stick to motorcycles whenever I feel the need for speed and looking for a thrill.